A mysterious and mythical motorcycle racer, Luke, (Ryan Gosling) drives out of a traveling carnival globe of death and whizzes through the backstreets of Schenectady, New York, desperately trying to connect with a former lover, Romina, (Eva Mendes) who recently and secretly gave birth to the stunt rider's son. In an attempt to provide for his new family, Luke quits the carnival life and commits a series of bank robberies aided by his superior riding ability. The stakes rise as Luke is put on a collision course with an ambitious police officer, Avery Cross, (Bradley Cooper) looking to quickly move up the ranks in a police department riddled with corruption. The sweeping drama unfolds over fifteen years as the sins of the past haunt the present days lives of two high school boys wrestling with the legacy they've inherited. The only refuge is found in the place beyond the pines. 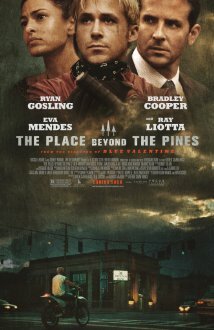 Derek Cianfrance's The Place Beyond The Pines is a visual odyssey, if nothing else. It is also an intense character study of three people. And it's a good film. The story is of Luke, a motorcycle stuntman, who quits his job after he finds out that Romina, played by Eva Mendes, his ex-girlfriend was pregnant and had his child. The trouble is, she married another man. Luke is torn between his new found love for his son, and his inability to hold a steady job. So, to take care of his 'family' Luke begins to rob banks, along with his friend, excellently portrayed by Ben Mendelsohn. Of course, this puts him on a collision course with Bradley Cooper's idealistic cop. Not wishing to ruin the plot, I won't say anymore. When I first heard the plot, I was immediately struck by the similarities to another excellent Ryan Gosling movie, Drive. In that film, Gosling plays a stunt driver, who takes on a job to help his neighbor. However similar the plot may be, the two films are complete opposites. The Place Beyond The Pines is a character driven study of morality and legacy, while Drive is closer to the genre of an action film. However, the two films do have one more thing in common, they both showcase excellent Ryan Gosling performances. In this film, Gosling's would be father, doing what he thinks is best, is at times aggravating and intensely emotional. It's a great performance, and a tricky one to master. But Gosling gets it, and turns in one of his best performances. That's not to say the other performances aren't spectacular as well. Eva Mendes turns in some of her best work in years, playing a woman torn between her desire to be with Gosling, and to have a normal family life with her husband. Bradley Cooper turns in his best work yet, playing a cop torn between his want for justice and his powerful ambition. As mentioned above, Ben Mendelsohn turns in some great work as does Ray Liotta. Mention must go to newcomer Dane Dehaan, performing in some of the film's most gut-wrenching moments. Then of course there is the director. Derek Cianfrance's style is completely unique, and incredibly effective. He is one director to keep an eye on. The cinematography is excellent, especially during the opening shot, when the camera follows Gosling from his trailer, across a fairground, onto a motorcycle and into a giant ball where Gosling rides around. That's not to say the film doesn't have it's bad points. The version I saw sagged in the end, even though it was necessary to the ending, I still feel they could have trimmed it down. I felt myself and a couple other audience members getting a little restless near the end. Despite the overlong ending, the film itself was still a great experience. A quiet moving character drama, expansive in it's scope yet intensely personal at its core. At a Q and A at the end of the film, Cianfrance admitted that what he really felt the film was about, was legacy, and passing the torch from generation to generation. And I think he is right.